The traditional sash of the kimono. Tokyo Kaleidoscope small collection of obis are often used to create slim line pencil skirts & dresses. Due to the limited amount of material available in an obi - generally only smaller sizes can be reconstructed. Our collection mainly consists of the more ornate Maru & Fukuro Obi designs. The traditional hip or thigh length kimono style jacket. Haoris can often be found in a range of colours. In our collection, you can find mainly bright colours, vivid prints & beautiful black haoris with embossing prints. Perfect for those who want a little something extra for a little black dress (especially if you’re not a colour person). Depending on the material available in each haori, a bespoke maxi frock/playsuit can be created. A single coloured kimono often found in a myriad of colours with subtle, beautiful prints embossed upon the fabric. We love finding these gorgeous iromujis on our kimono searches, especially when we discover strong, bright colours as the majority of them are in pastels. The perfect choice if you’re not a fan of obvious prints or patterns but still love kimonos and would love something reconstructed from them. An everyday kimono characterised by it’s print of “fine pattern”, this type of kimono could traditionally be dressed up or down depending on the occasion. Our collection mainly consists of a variety of gorgeous komons (often with a floral print or the dotted edo komon prints) in a myriad of colours. Perfect for reconstruction into a bespoke maxi frock, playsuit or a range of separates if you want more versatility. A formal kimono with shorter sleeves worn traditionally by married women for special occasions. Classically a Tomesode has a main body of black. Tokyo Kaleidoscope tends to favour Irotomesodes which feature a single-color background with the pattern featuring below the waistline. We love reconstructing beautiful maxi frocks out of these kimonos to give the patterns the best showcase possible. The “swinging sleeve” kimono, named for their beautiful, extra long sleeves. Traditionally worn by unmarried women at formal occasions, we love all the gorgeous, colourful prints and details found in Furisodes which just gives us so much more to reconstruct with. It’s a very happy day when we find more that we want to add to our collection. The original fabric roll, before it has been sewn into its chosen kimono shape. Sometimes on our vintage kimono hunts, we come across the original tanmono rolls of kimonos. 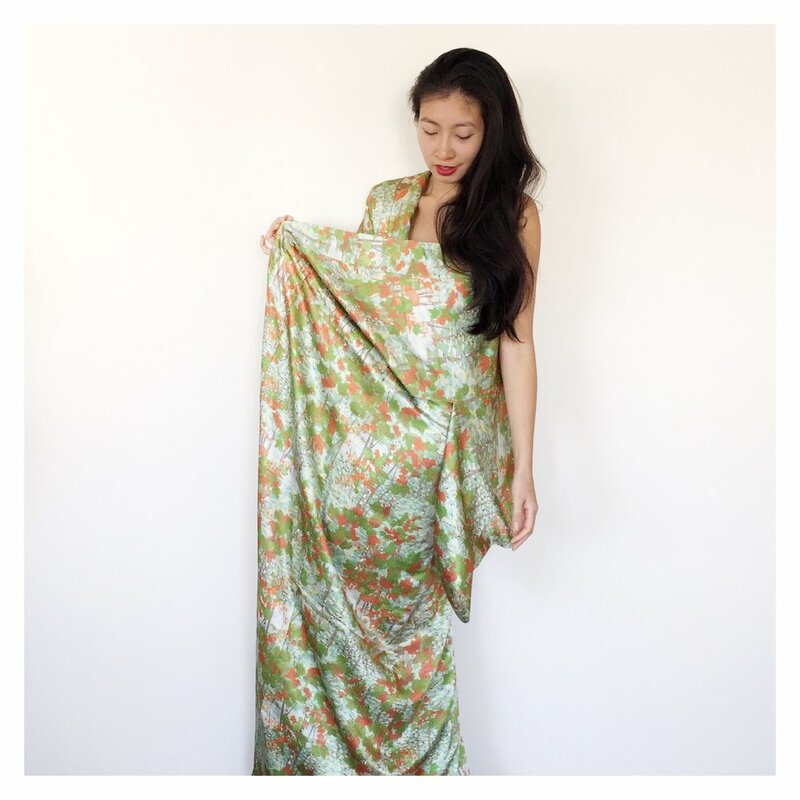 When Lia finds a print she loves in this form, she couldn’t be happier - as the fabric has not been cut at all and is in one continuous roll ready to be constructed into something fabulous. On average, a roll is about 12m long.